It took three programs to make this. 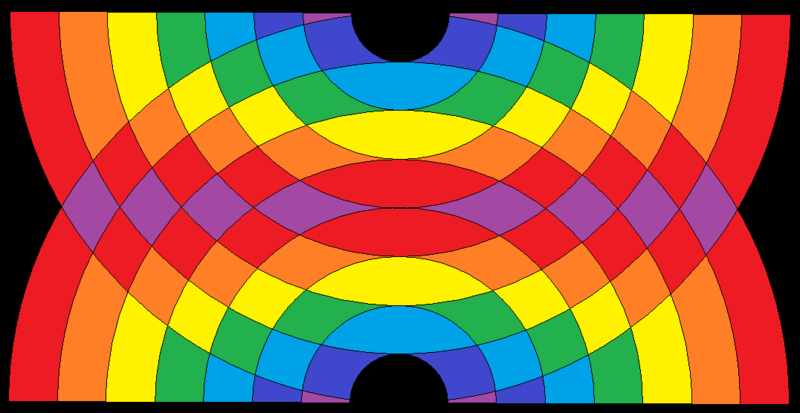 First, outlines of the “double rainbow” patterns on each face were constructed using Geometer’s Sketchpad. A screenshot from that program was then pasted into MS-Paint, which was used to add color to the outline of the pattern on each face. Next, the colorized image was projected onto each face of a rhombic triacontahedron, using Stella 4d: Polyhedron Navigator — the program that put this all together, and what I used to generate the rotating .gif above. Stella is available at http://www.software3d.com/Stella.php, with a free trial download available. Interestingly, while this polyhedron itself is not chiral, the coloring-pattern of it, shown above, is. Created using Stella 4d, which you can find at this website.